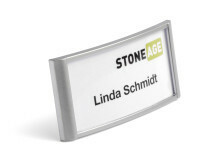 Transparent self-laminating name badge with adhesive combi clip. Ideal for quick lamination of business cards or ID passes up to 54 x 90 mm. 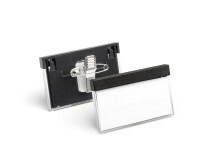 Adhesive combi clips are supplied separately to enable both landscape and portrait use. 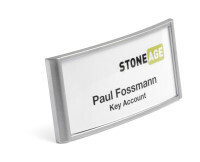 Moulded polypropylene fold out name badge with replaceable blank insert and combi clip. Combi clip name badge - with pin and clip for choice when attaching to clothing. Supplied with blank inserts sheets (non-printable). CLASSIC name badges with an elegant, galvanised silver finish for long term use. With pin and clip fastener for multi-functional use.